Finally got a chance to pop in to this off license this evening with my mate Damien. 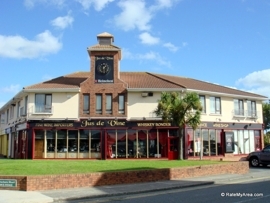 Jus De Vine is located on the main street of Portmarnock just after the Golf Links Pub on the right. They have a nice selection of beers but its Wine they excel in. My lord I could spend a small fortune in here. I found them to be very knowledgeable in there and extremely helpful, I dont pertain to know the in's and out's of wine but like to think I am learning. I wanted maybe 2 deep rich wines , I was drawn to buying maybe a Malbec or Ripasso but with the advise of the girl working there I decided on a Rasteau and a Zinfandel. I am hoping to give these a go during the week, so I will try and do a review of both from my limited wine knowledge. In conclusion I was glad I listened to Paul down in Mac's Off License ( Ennis Road, Limerick) by paying a visit to Jus De Vine.